Going along with our dividend-themed Ideas panel this week, we’re throwing in a bonus feature on a dividend yielder and a dividend grower. Yielders pay high dividends and generally tend to be slow growing stocks. Growers have lower yields, but are usually faster growing companies with a history of increasing dividends and clearance to further increase it in the future. If you’ve followed our blog for some time, you probably know that we are partial to dividend growers. They provide a nice mix of income and capital appreciation that can provide excellent total return over the long term. Plus, the growing dividend is often a sign that the company is strong and well managed. But dividend yielders have the advantage of providing an attractive and usually stable stream of income right off the bat, so they will never go out of style. Both of these picks turned up in the dividend screeners that are featured in our Ideas panel this week and are available for free download in our Library. You’ve probably heard of this high end automaker from Germany. BMW trades under both BAMXF and BMWYY (note we use BAMXF in our screenshots, but BMWYY may be a better pick for the volume reason described later). We picked it up through the Yield Screener and liked what we saw on a first pass of its financials. In addition to its reputable luxury cars, BMW also makes motorcycles and is attempting to take on Tesla in the electric vehicle space. BMW has industry-beating margins, slow but steady growth on both the bottom and top lines, a lush dividend yield of 4.3%, and an inexpensive valuation. 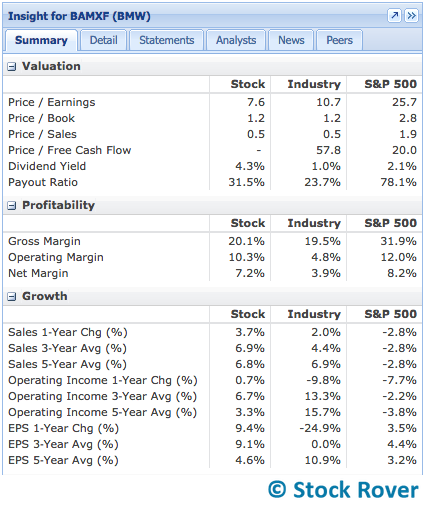 The following table shows all this, compared with averages for the auto manufacturers industry and S&P 500. Here’s another nice thing: analysts have increased their earnings estimates multiple times in the last 90 days, as seen below. 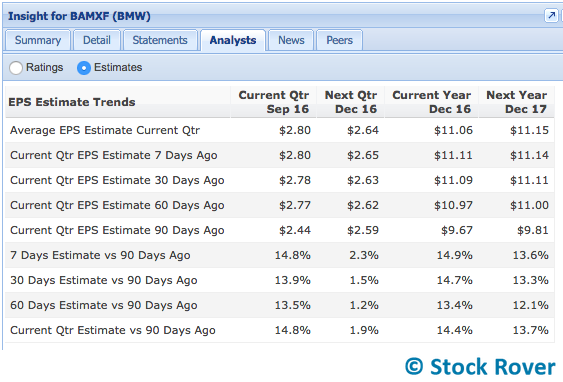 This provides confidence in BMW’s near-term outlook. BMW falters when it comes to financial health metrics. The company has high debt and has operated with negative free cash flow for many years. It’s not all bad, though; for example, the company has a reassuringly high interest coverage ratio (34.6). In the US, BMW is traded on OTC Pink Sheets, which is much less regulated than the NYSE or NASDAQ and is generally home to penny stocks and other risky investments. However, several well known and stable companies do trade on the OTC Pink Sheets exchange, so it should not be a disqualifier if you are hesitant to go “off brand.” It is however worth noting that BAMXF has a very low trading volume; BMWYY has a more normal volume. First American Financial (FAF) ranked #8 in our Dividend Growers ranked screener. It is a mid cap in the specialty insurance industry, offering title insurance and a variety of other real-estate related services. Thus it is largely tied to the fortunes of the housing sector and commercial real estate. Next week’s housing starts and existing home sales reports will provide timely insight for FAF’s industry. First American Financial appears to be in good financial health, with relatively low and manageable debt and positive free cash flow that has increased over time. It has grown at a moderate clip, with bottom line growth outpacing top line growth. Like BMW, FAF’s earnings estimates have been increased in the last 90 days, auguring well for the near term. It also appears to be, if not cheap, at least reasonably priced. Although FAF’s price/earnings multiple is higher than the industry average, it is well below the company’s 5-year P/E high. And of course it wouldn’t be a dividend grower without a solidly growing dividend—FAF has increased its dividend year over year since it started paying out in 2010. The yield isn’t too shabby either at 3.3%. The payout ratio, at 36.0%, also leaves plenty of room for growth. Note that FAF’s margins as well as its capital efficiency metrics, such as the ROIC and ROA, are fine, but below industry averages. They have however been on a rising trend since 2013, which often signals good management. Our cursory survey did not turn up anything too damning about the stock, but its growth does appear to be slowing, with next year’s estimated sales and EPS numbers at or only slightly above this year’s. Hopefully these two tickers give you a little something to chew on for your own portfolio. While we have jump-started the quantitative research, be sure to run your own vetting process to make sure these (or any stock you’re considering) meet your standards. For more dividend inspiration, head to our Ideas panel this week on Stock Rover Markets, or explore the dividend screeners in our Library. Great post as always! Thanks for the insight into these two stocks. I don’t think these companies are investing in.